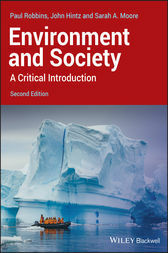 Substantially updated for the second edition, this engaging and innovative introduction to the environment and society uses key theoretical approaches to explore familiar objects. Paul Robbins is Professor and Director of the Nelson Institute for Environmental Studies, University of Wisconsin–Madison. His research interests include understanding human–environment systems, the influence non-humans have on human behavior and organization, and the implications these interactions hold for ecosystem health, local communities, and social justice. He is the author of Political Ecology: A Critical Introduction (2nd edition, Wiley Blackwell, 2012) and Lawn People: How Grasses, Weeds, and Chemicals Make Us Who We Are (2007). John Hintz is Associate Professor of Environmental, Geographic, and Geological Sciences at the Bloomsburg University of Pennsylvania. His current research focuses on land-use conflicts, environmental policy, and the US environmental movement. He has published in a number of journals, including Capitalism Nature Socialism and Ethics, Place & Environment. Sarah A. Moore is Assistant Professor in the Department of Geography at the University of Wisconsin–Madison. Her research focuses on urban development politics, urban environmental issues, and environmental justice inthe United States and Latin America. Her publications include articles in numerous journals including Progress in Human Geography, The Professional Geographer, and Society and Natural Resources.